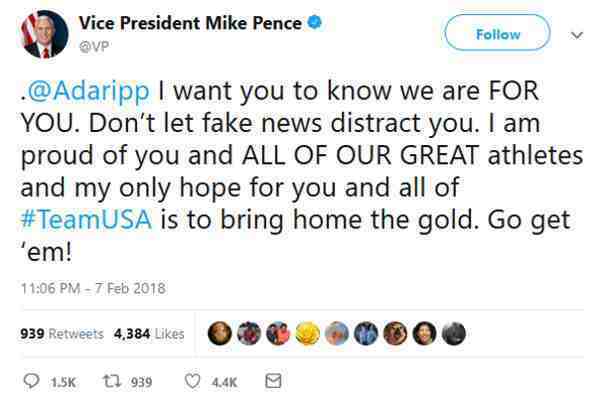 Vice President Mike Pence has tweeted a message of support to out athlete Adam Rippon. Earlier this week, USA Today reported that Pence attempted to arrange a meeting with Rippon after the figure skater criticized the White House's selection of Pence to lead the 2018 U.S. Olympic delegation because of his opposition to LGBT rights. Rippon, one of two openly gay athletes headed to the Winter Olympics, reportedly turned down the request. “If it were before my event, I would absolutely not go out of my way to meet somebody who I felt has gone out of their way to not only show that they aren't a friend of a gay person but that they think that they're sick,” Rippon, 28, said in January, a reference to Pence's reported support for therapies that attempt to alter the sexuality or gender identity of lesbian, gay, bisexual and transgender people. A Pence spokesman in 2016 denied that Pence supports so-called conversion therapy. According to USA Today, Pence's staff asked the U.S. Olympic Committee to set up a conversation between Pence and Rippon just one hour after Rippon's comments were published online.